Stillages are mainly used to transport goods without the need to load and unload the product being carried, which saves time and decreases the chance of damage. An example is the use of stillages in the glass industry, where they are shaped like an upright “A”; the glass leans inward and is strapped to the stillage ready for transport. 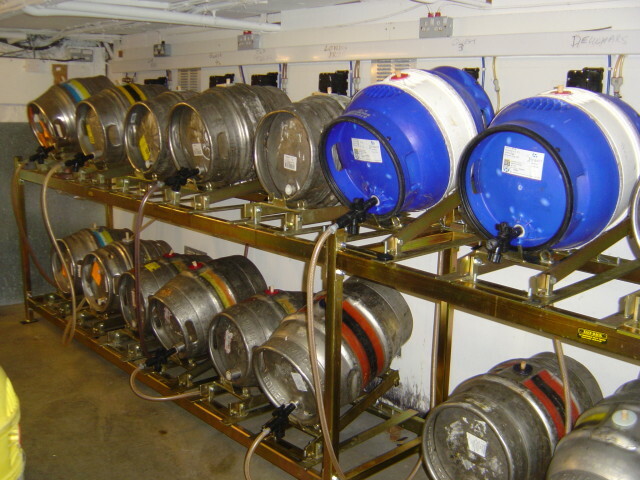 A stillage is any device on which a cask of ale is placed for service. Unlike kegs, which can be simply stood upright on the floor, casks are used lying on their sides. This allows the beer to run from the tap under gravity, with room in the “belly” of the cask below the outlet for the finings to collect. The shive with the spile will then be the highest point on the cask. As the beer clears (see finings), the inside of the cask becomes coated with sediment. It is important that the stillage holds the cask absolutely still with no rocking or shaking, otherwise the sediment will be shaken into suspension and the beer will be cloudy. A stillage need not be complicated – anything that will support a cask (preferably on three points to avoid any wobbling) will do. At temporary events, sturdy tables or frames made of scaffolding and planks might be used, with the casks placed on wooden wedges (two at the front, one at the back). At the other end of the scale, many pub cellars use specially-made steel racking, often with two rows of casks one above the other. Some pubs have brick or stone stillages, sometimes quite ancient, built into the wall of the cellar. As the cask empties, it needs to be gently tilted to obtain the last of the beer. With wooden wedges, moving the rear wedge forward will achieve this; purpose-built metal units often have springs incorporated that automatically tilt the cask as it becomes lighter. This requires less effort from bar staff, and also helps beer quality – the lift is so smooth and gradual that there is no danger of stirring up the lees and making the beer cloudy. Tea: Until the Victorian era, people blended their own tea at home. Often this was within the housekeeper’s duties. Each tea was stored in a tea chest, with many compartments to keep the teas separate. The chests were equipped with a heavy lock, as the tea was expensive. Afternoon tea was generally served between three and six of the clock. Those closer to three of the clock sported a lighter fare of food. High tea, with heavier selections of food, was closer to six. High tea was never meant to be a “fashionable” event. The practice came from the workers returning home from their jobs at five or six. As was customary, dinner was served between seven and eight of the clock. The “high tea” was a quick meal for the very hungry workers. Housekeepers mixed cheaper tea leaves, usually those known as Common Bohea or Common green leaves, being mixed with more expensive teas: Hyson, Congo, and Gunpowder. 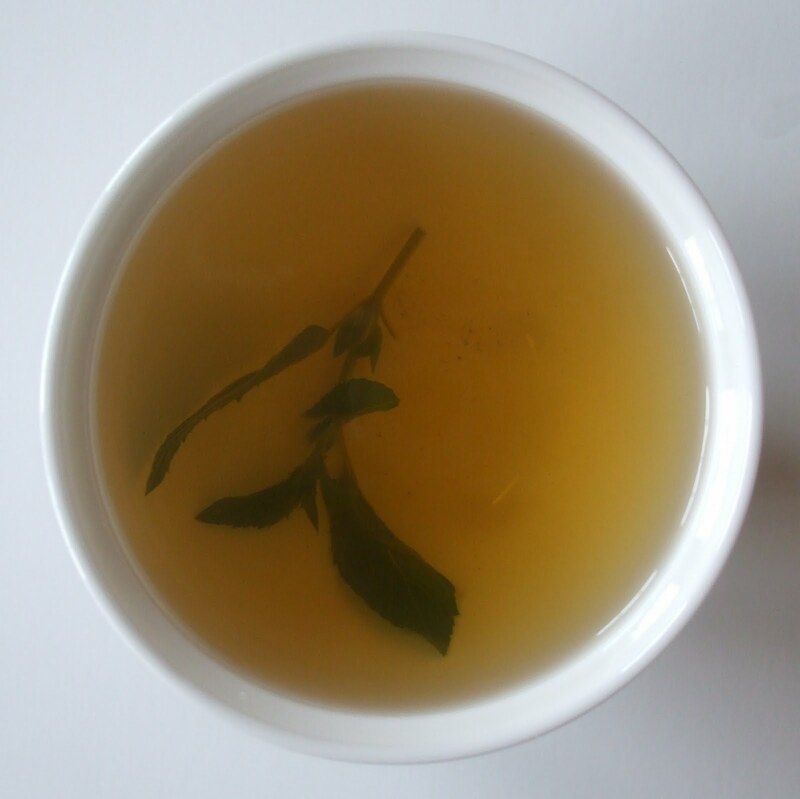 Tea Adulteration: “New tea” was often sold in the marketplace. Estimates say 1500 pounds of “new tea” was processed each week in 19th Century London. Servants and the poor working class often sold used tea leaves to tea vendors. The old leaves were redried on heated plates and redyed. A dye containing copper brought back the green tones to the leaves. Logwood would be used to restore the color to black teas. This recycled black tea leaves were known as “smouch” and were often sold to the lower classes. 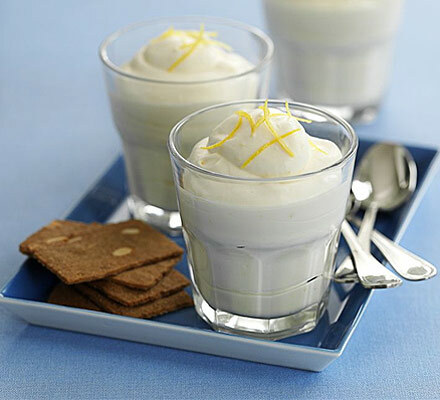 Syllabub (also sillabub, sillibub) is a traditional English dessert, popular from the 16th to the 19th century. It is usually made from rich milk or cream seasoned with sugar and lightly curdled with wine. Mrs Beeton (1861) gives two recipes. One author’s recipe says to mix the other ingredients together in a large bowl, “place the bowl under the cow, and milk it full.” The recipe can be traced back to the time of the Tudor Dynasty. In its early variations, syllabub was a drink made of new milk and cider, with the cows milked directly into an ale pot. A variation, known as an Everlasting Syllabub, allows for the cream to rise and thicken by letting it stand for several days. 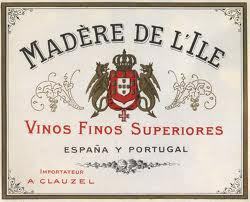 The middle classes drank port, sherry, and Madeira, brown brandy, and gin in place of the expensive wines. It is possible that distillation was practised by the Babylonians in Mesopotamia in the 2nd millennium BC, with perfumes and aromatics being distilled, but this is subject to uncertain and disputable interpretation of evidence. The earliest certain chemical distillations were by Greeks in Alexandria in about the 3rd century AD, but these were not distillations of alcohol. The medieval Arabs adopted the distillation technique of the Alexandrian Greeks, and written records in Arabic begin in the 9th century, but again these were not distillations of alcohol. Distilling technology passed from the medieval Arabs to the medieval Latins, with the earliest records in Latin in the early 12th century. The earliest records of the distillation of alcohol are in Italy in the 13th century, where alcohol was distilled from wine. An early description of the technique was given by Ramon Llull (1232 – 1315). Its use spread through medieval monasteries, largely for medicinal purposes, such as the treatment of colic and smallpox. The art of distillation spread to Ireland and Scotland no later than the 15th century, as did the common European practice of distilling ‘Aqua Vitae’ or spirit alcohol primarily for medicinal purposes. The practice of medicinal distillation eventually passed from a monastic setting to the secular via professional medical practitioners of the time, The Guild of Surgeon Barbers. The first confirmed written record of whisky comes from 1405 in Ireland. In the Irish Annals of Clonmacnoise in 1405, the first written record of whisky attributes the death of a chieftain to “taking a surfeit of aqua vitae” at Christmas. In Scotland, the first evidence of whisky production comes from an entry in the Exchequer Rolls for 1494 where malt is sent “To Friar John Cor, by order of the king, to make aquavitae,” enough to make about 500 bottles. With a licence to distil Irish whiskey from 1608, the Old Bushmills Distillery in the north coast of Ireland is the oldest licenced whiskey distillery in the world. In 1707, the Acts of Union merged England and Scotland, and thereafter taxes on it rose dramatically. After the English Malt Tax of 1725, most of Scotland’s distillation was either shut down or forced underground. Scotch whisky was hidden under altars, in coffins, and in any available space to avoid the governmental Excisemen. Scottish distillers, operating out of homemade stills, took to distilling whisky at night when the darkness hid the smoke from the stills. For this reason, the drink became known as moonshine. At one point, it was estimated that over half of Scotland’s whisky output was illegal. In America, whisky was used as currency during the American Revolution. It also was a highly coveted sundry and when an additional excise tax was levied against it, the Whiskey Rebellion erupted in 1791. This entry was posted in British history and tagged beer, brandy, cognac, libations, Maderia, sherry, stillage, Syllabub, tea, tea adulteration, wine. Bookmark the permalink. I always learn so much from your blog! I enjoyed reading your post very informative.